This example illustrates the copy all records script step. 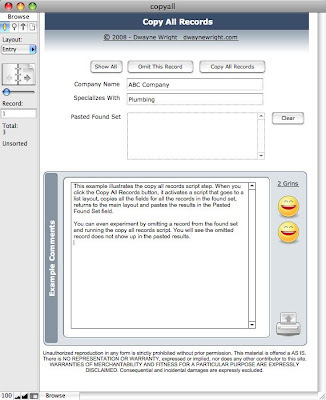 When you click the Copy All Records button, it activates a script that goes to a list layout, copies all the fields for all the records in the found set, returns to the main layout and pastes the results in the Pasted Found Set field. You can even experiment by omitting a record from the found set and running the copy all records script. You will see the omitted record does not show up in the pasted results.